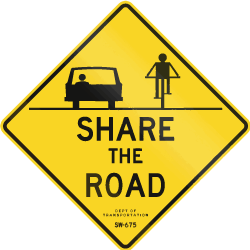 Be respectful - In the absence of a designated bike lane it’s always safer for you and the group to ride single file. Don't Abandon Riders - This is a recipe for disaster. That person you left behind may need help with a flat, not know the route back, have an accident. The possibilites are endless. Don't contribute to them. Don't Half Wheel - The right way to ride in a double paceline is handlebar-to-handlebar, not half a wheel ahead of the rider next to you. Half-wheeling pisses people off, especially when you accelerate to maintain the half-wheel advantage despite your partner’s attempt to pull even with you. It also messes up the spacing for everyone in the paceline behind you.